Why Do So Many Nevadans Still Die on the Job? 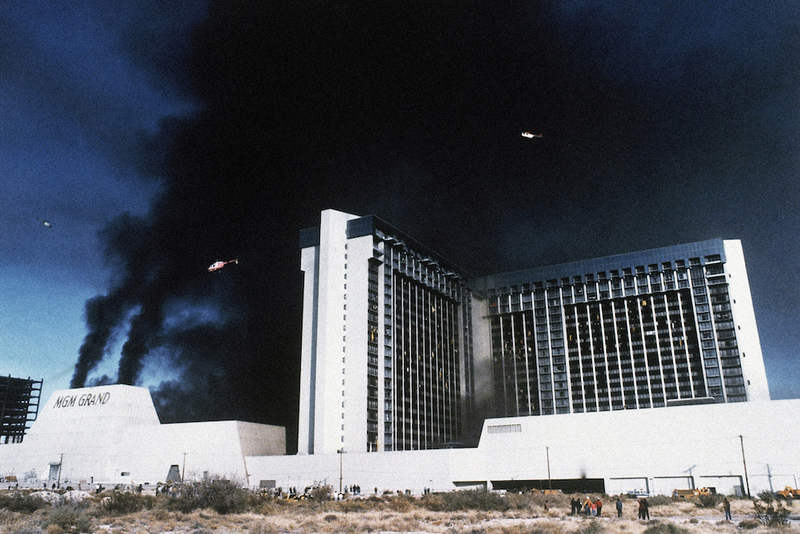 A military helicopter sweeps near the burning MGM Grand Hotel in Las Vegas, on November 21, 1980. The fire claimed 85 lives. Courtesy of Associated Press. In the span of 18 months in 2007 and 2008, Nevada was the scene of 12 worker fatalities at casino construction sites. The disasters were not small: A 7,300-pound wall collapsed and crushed two men. An elevator struck an operating engineer. A beam broke and an ironworker fell with his safety harness still attached to the beam. A post collapsed and dropped a safety engineer five stories. Every six weeks on average, a worker died. The news reminded many of the Hoover Dam, a project known for its treacherous working conditions and a death count so high that it spawned myths that workers had been buried alive in the concrete. But since the Hoover Dam’s construction in the 1930s, workers have benefitted from the federal Occupational Safety and Health (OSH) Act of 1970, so that accidents are no longer considered a part of the job, and employers and the government are morally and legally obligated to protect them. Still, fatalities in high-rise casinos on the Las Vegas Strip brought up an uncomfortable question: How had the American workplace become so profoundly dangerous all over again? Under American law, work and risk always have had a close relationship. Departing from English common law, 19th-century American courts developed the assumed risk doctrine, holding that agreeing to employment meant that workers in a free market had consented to assume all potential hazards of the job. Legal precedent also protected employers, and so accidents were considered part of the work process. Early in the 20th century, several factors caused a shift of responsibility for safety from workers to employers. The first was simple economics: Business was not profitable if accidents stopped work, prompting the railroad, iron, lumber, and steel industries to develop basic safety programs and hire company physicians. The second cause was progressivism, an informal, nationwide reform movement that experimented with the idea that governments should provide information about industrial hazards and chemicals, and place controls on employers. By 1921, the progressive ethic had encouraged 46 states to pass an assortment of health laws and workmen’s compensation. But the private sector partnered with the Harding, Coolidge, and Hoover administrations to repress labor unions, and remove economic regulations and industrial safety controls. By the time the nation fell into an economic depression in 1929, employees regularly ignored safety standards to keep their jobs and employers disregarded well-known hazards, including silica, carbon monoxide, and lead, to stay in business. The most egregious example of this occurred in 1930 at West Virginia’s Hawk’s Nest Tunnel, where at least 764 workers died from acute silicosis and related conditions caused by breathing dust. The construction of the Hoover Dam, which began in April 1931, occurred during this tenuous period for worker protection, and was further complicated by federal law in Nevada. The state legislature sent the state inspector of mines, Andy J. Stinson, to tour the site and make recommendations that included barring gasoline-powered vehicles in tunnels, outlawed in Nevada in 1929 because it inevitably exposed workers to carbon monoxide. Six Companies Inc., which was the contractor, ignored the order, insisting it would be financially impossible to convert to electric. The project then began six months ahead of schedule without housing, medical care, or sanitary facilities for workers. The excessive heat, averaging 119.9 Fahrenheit during the summer, hospitalized 150 workers and killed 17 during the first months of construction. These deaths were part of a string of mishaps under the direction of chief engineer Frank Crowe, a supervisor famous for placing unrealistic expectations on workers to finish the job ahead of schedule. Despite state warnings, Six Companies persisted in drilling the tunnels with gasoline-powered equipment. Large carbon monoxide clouds accumulated underground, leading some workers to suffer from nausea and dizziness, while others became completely incapacitated. Entire shifts became unconscious and crews had to drag their bodies out. Company doctors never listed a single employee death as carbon monoxide exposure, but “pneumonia” and “heart trouble” fatalities surged—both conditions that relinquished the employer of liability. Over the five years of construction, 37 workers died of such ailments, usually in clusters. When the state filed formal charges in November 1931, the contractor applied for a temporary restraining order maintaining that the federal project was not subject to state intervention. Secretary of Interior Ray Lyman Wilbur, a medical doctor who understood carbon monoxide poisoning, fully supported Six Companies’ decision. He even provided federal counsel to appear amicus curiae in statutory court to “protect the interests of the United States.” A panel of federal judges ultimately ruled in favor of the contractor in 1932, extending the temporary restraining order until further trial. A year later the judges officially exempted the project from state mining code, determining that the Nevada law only applied to mining, not reclamation. Ultimately as many as 187 workers died building the dam. Contrary to popular memory, no workers were buried alive in the concrete—that myth arose during construction as a social response to the high death toll. The Hoover Dam would forever be remembered as a coffin of the workers who built it. It wasn’t until the 1960s that worker health and safety became a priority in the United States. Radioactive fallout from nuclear weapons testing raised an initial alarm, followed by greater public awareness of chemical pollution surrounding industrial plants, the widespread use of pesticides in agriculture, and the prevalence of hazardous chemicals in household cleaning products. Americans realized that industrial hazards rarely stayed within the confines of the workplace, eventually affecting us all. This revelation prompted a symbolic switch in name from industrial to occupational health, which paved the way for regulations protecting workplaces, communities, and the environment from harm. By the end of the decade, a combination of environmental and Vietnam War activism, along with skyrocketing accident rates, brought workplace safety to the national discussion, leading to the passage of the OSH Act in 1970. The Act created two federal agencies, a regulatory agency in the Department of Labor, the Occupational Health and Safety Administration (OSHA), and a research agency, the National Institute for Occupational Safety and Health (NIOSH), as part of the Centers for Disease Control and Prevention, and the Department of Health and Human Services. Since their establishment, fatality and injury rates have dropped dramatically, from approximately 14,000 workers killed on the job in 1970 to 5,190 in 2016. Fatalities in high-rise casinos on the Las Vegas Strip brought up an uncomfortable question: How had the American workplace become so profoundly dangerous all over again? But in the decades since OSH, the United States has entered the postindustrial age, marked by a dramatic decline in industrial work due to automation and imports. Multinational companies also responded to regulation by moving dangerous manufacturing overseas. As the economy deindustrialized, employment in postindustrial trades like service, technology, health care, finance, and education grew. In comparison to the industrial workplaces, these new postindustrial spaces appeared dramatically safer. But the workplaces still functioned like factories and postindustrial workers faced new hazards, with risks that were now harder to identify, define, and interpret. The Las Vegas Strip exemplifies this shift, as it employs thousands of employees to continuously reimagine and construct the next great experience in hospitality. Before the 1970s, these resorts resembled beachfront hotels, built low and sprawling, but as their structures grew upward, so did the hazards, increasing both construction-related injuries and workplace dangers. For example, during the construction of the MGM Grand, Taylor Construction Co. overlooked recommendations to install sprinklers. On November 21, 1980 a devastating fire killed 85 people at the resort. Afterward, a state panel voted against revamping the Nevada fire safety code, citing cost concerns. It took another tragedy three months later, in which eight people died in an arson-related fire at the Las Vegas Hilton, to force change. Nevada responded fiercely the second time around, passing the strictest fire protection standards in the nation, a move that inspired a global reevaluation of sprinkler use in high-rise buildings. By the 2000s, construction at the Las Vegas Strip resembled, in some ways, the building of the Hoover Dam. Sandwiched between resorts, the congested, frenzied, 24-hour construction sites left even experienced journeymen frightened for their lives. While there were similarities between the two worksites, the workers labored in completely different times. By law, the building company, Nevada unions, and federal and state OSHA should have worked to protect the Strip workers. Instead, they failed them by initiating speedups, weakening safety requirements, and withdrawing or reducing citations for violations. The episode reveals the limits of simple conceptions of responsibility. There is a misconception that the private sector is solely to blame for fostering hazardous workplaces. National, state, and municipal governments are usually involved in the worst cases, as they actively assist dangerous industries to promote industrial development. We now find ourselves in an ongoing struggle between constantly evolving workplaces and regulations that remain frozen in time. Not only do the OSH Act’s protections fail to protect postindustrial sites, but when we look carefully at the history of occupational safety and health, we can see that its progress in protecting workers has not been linear, in part because workplaces and safety have also changed in non-linear ways. Nowhere is this clearer than in today’s need to protect employees and guests from large-scale acts of violence such as the Route 91 Harvest festival shooting—an event no one could have predicted 47 years ago. Even before the shooting, where a lone gunman killed 58 and injured 515 at a music festival on the Las Vegas Strip, fatal injuries among hospitality workers nationally were up 32 percent in 2016 from 2015, and those involving violence increased 23 percent to become the second-most common fatal event. This points to the ongoing evolution of what we consider workplaces, and safety. Workplaces can be protected, but the occupational health regimes need to be flexible enough to evolve to settings that are always changing. The high death counts at the Hawk’s Nest Tunnel and the Hoover Dam seems barbaric to us 88 years later. We have to assume that 58 people dying at a country music festival will seem equally barbaric in the future. Michelle Follette Turk is a historian at the University of Nevada, Las Vegas. Her most recent book is A History of Occupational Health and Safety: From 1905 to the Present.